Our first portion of restoration in the Lower Sandy Basin, Happy Creek, has been rerouted to its original course and reconnected to the Sandy River. This project increases habitat for anadromous fish in a priority habitat zone identified by the Sandy River Basin Partners. This side channel reconnection included the creation of step pools to support fish swimming upstream, riparian plantings, the replacement of a culvert to reduce the impacts of a road crossing over Happy Creek, and the restoration of Happy Creek to its historic channel location. We are happy to announce the completion of our Happy Creek Reconnection project in Oxbow Park. 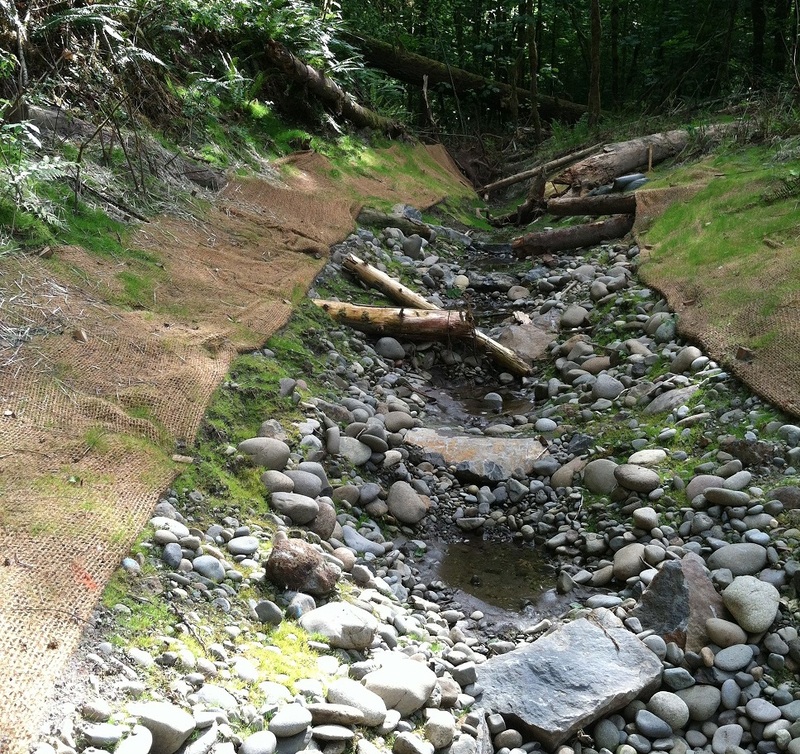 With funding from the Oregon Watershed Enhancement Board, PGE Habitat Fund, East Multnomah Soil and Water Conservation District, and the Oregon Fish and Wildlife Department, the perennial creek and side channel once known as ‘Dismal’ are now reconnected to improve salmon habitat. Happy Creek is the first phase of a reach-scale restoration effort in the Lower Sandy Basin. This project added stream complexity by building a large log jam at the inlet to the side channel, while reconnecting Happy Creek to its original streamed, creating refugia for migrating salmon and steelhead in a high-use recreation area with multiple stakeholders. Happy Creek’s restoration also serves as a public learning laboratory, as students from Mt. Hood Community College natural resources program explored the construction site for part of their coursework, and Corbett High School students are monitoring Happy Creek’s water quality. The restored side channel at Happy Creek neighbors the next Lower Sandy restoration priority, the side channel flowing into YMCA’s Camp Collins. The Council recently secured funding for restoration at Camp Collins in 2014, the second of five stages of reach-scale restoration identified through a study completed in 2011 by Metro, BLM, the Council and other Sandy River Basin Partners.